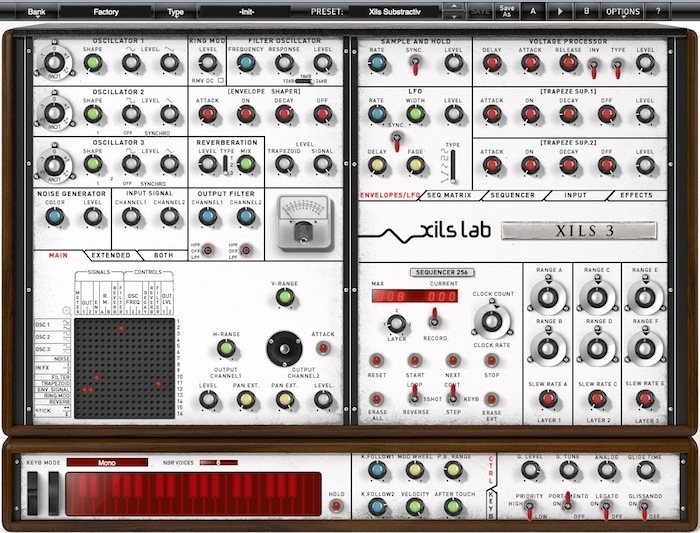 XILS 3 is capable of creating both 'classic' sounds and totally new ones. Its matrix design is capable of more than 450 connection permutations, offering more routing possibilities than any other commercially available virtual synthesizer, according to XILS-lab. In addition, a built-in sequencer, based on the EMS 256 sequencer, can be used to create original and complex sequences. XILS 3 comes with hundreds of presets, made by famous sound designers, that provide instant access to a broad range of sounds and styles ranging from modern electronica to classic 1970s retro and experimental. Of course, you can also program it yourself to create your own unique sounds. Three aliasing-free oscillators: sine, ramp, square, triangle.